What does the name of Osiris, the Beloved of Isis, mean? This time, let’s talk about the name of the Beloved of Isis, Osiris. "Isis" in hieroglyphs; She shares the throne symbol in Her name with Her beloved Osiris. Indeed, He is as many-named as She. Just as Isis is called “Goddess in All Names,” so Osiris is “Osiris in His Every Name.” And in the same way that the Oxyrhynchus papyrus lists the names by which Isis is known in the nomes and cities of Egypt, so we have Osiris linked with an enormous number of places in Egypt: Osiris in Buto, Osiris in the Laboratory City (interesting, huh? ), Osiris in the Hawk City, and so on. 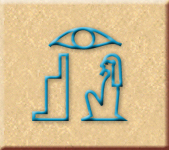 The most common form of Osiris' name in hieroglyphs. He shares the throne symbol with His beloved Isis. 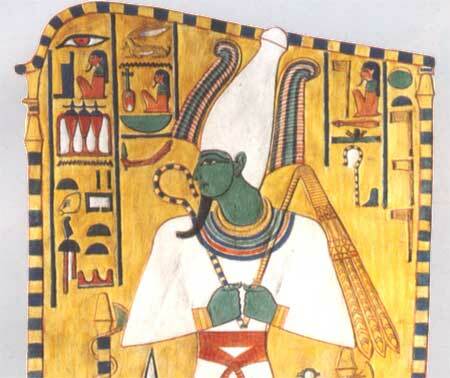 And just as Isis’ name is relatively simple when written in hieroglyphs, so is the name of Osiris. The most compact version of Isis’ name is simply the hieroglyph for “throne,” which She wears on Her head, while the simplest and oldest form of Osiris’ name is written, “throne and eye.” Yes, it’s the same throne as in the name of the Goddess. It seems clear that Isis and Osiris were always conceived of as a couple, both sister-brother and wife-husband. Their very names are connected. Osiris is the Greek version of the God’s name. In Coptic, a late form of Egyptian, He was Ousire or Ousiri. As with Isis, scholars are not completely sure how His name would have been pronounced in ancient Egyptian. We have only these later forms from which to judge. Current thinking seems to be that the ancient Egyptian form would have been something like Wsir. The W here is one of those consonants that is sort of vowel-like; in this case, it could have been pronounced as a “u” or an “o,” which would give us Usir or Osir or, to give it a little bit of the w-sound, Wusir. Why doesn’t the throne sound the same here as it does in Isis’ name? Well, that very problem has prompted some scholars to posit an as-yet-undiscovered early form of Isis’ name that would have been something like Wset. But remember that the throne is a biliteral symbol and consists of two sounds. There’s a glottal stop, then the “s.” Just as with Isis’ name, this means that any vowel could have been between the glottal stop and the s. And just as with Isis’ name, since hieroglyphs have no vowels, our best clue as to which vowel the Egyptians used comes from Coptic and Greek. They wrote His name with an “O” or “Ou.” So instead of the Anglicized Oh-SIGH-riss, His name would have been something like Oh-SEAR, Oo-SEAR, or Oh-SEAR-ee. The green-faced Osiris, Lord of the Otherworld, Lord of Renewal. As for the meaning of the God’s name, some have interpreted Osiris simply as “the seat or throne of the eye.” In this explanation, the eye is the sun (remember that the sun and moon are considered to be the eyes of various Gods, like Horus or Re). As Osiris-Re, Osiris does have solar connections, but He is more often associated with the moon, so perhaps the Osirian eye should should more rightly be the moon. But the hieroglyphic eye is not just an eye, it is the word ir or iri, which means to do, to create, to form, to fashion, to beget, to produce. So there is an active aspect inherent in the God’s name. Thus some researchers have suggested that His name means “He Who Takes His Throne,” which makes some sense with Osiris’ connection with the pharaoh; yet His connection is usually with the dead pharaoh, the living king being associated with the son of Isis and Osiris, Horus. Another version, “He Who Makes His Seat,” could be idiomatic…perhaps making one’s seat or place was a way of saying one took power or took one’s rightful place. This could be true of Osiris when He “took his seat” in the Otherworld as judge of the dead. Indeed, some Egyptologists think His name may mean something like “He Who Has Sovereign Power” or “the Mighty One.” It has been suggested that Isis’ name might mean something like that, too, because of the throne in Her name. If Osiris is simply the Mighty One, it could refer to His mighty power as Lord of the Dead. Isis is mighty as a Goddess of renewal and of magic. One Egyptologist even considered the possibility that Osiris was originally a Goddess (because of the feminine throne in His name), Who eventually came to be thought of as male. This one makes little sense to me since it’s rather important that Osiris is male. Surely the throne in His name shows not that He was originally a Goddess, but that He has an important relationship with Isis. Yet another explanation is that Osiris is “the place of doing or creation.” This makes sense if we think—as the Egyptians did—of the Otherworld as the source of renewal on earth. As Lord of this creative and renewing place, Osiris “is” the seat or place of creation. Along those same lines, I’ll add my own interpretation to the list. On a very basic level, I like the idea that Osiris means simply the Lover of Isis. On a more esoteric level, if Isis the Throne is the Goddess of Existence, and if the name of Osiris contains the throne not just by coincidence, then perhaps Osiris is “Existence Doing,” that is, active and creative existence. His ongoing “doing” creates a kind of ever-lastingness. This puts Him in His correct role as the Lord of the Otherworld, the land of ever-renewing, ever-lasting existence. And it brings Isis into this renewing place with Him—as She always was and always is. Isis and Osiris are the Lady and Lord of Coming Into Existence and Ongoing Existence. They are the Lady and Lord of Ever-Lasting Renewal. All things that return to the darkness of the Otherworld are renewed at the hands of the Goddess and God that they may be reborn into the light. Previous Previous post: What does the name “Isis” mean? Thank you for writing this post. It is so timely as I’m working quite a bit with Osiris lately and trying to understand His energy. It really helps to put it in the context of Isis. Oh definitely there’s a connection with Orion and Sirius…at least in Egyptian terms. The Egyptians at times considered Orion the “soul of Osiris” as Sirius was the “soul of Isis.” Even in the Pyramid Texts, Sirius-Isis and Orion-Osiris are connected in myth…and in the reality of the skies. Yes, you are right, about Aset or Achita meaning to have sexual relations with a woman; not the other way round; it is found in some African languages. Good to know someone else has hit upon the same idea. By the way, *chita (cheta, Kita; cf. Sita, Set) also means “do” in many African languages.